Just called AE support to ask and see if they know whats up with the diffs. the guy who answered the phone didn't know, but he asked someone else over there and before he could finish asking the question, the other guy said to take out one of the shims and/or add an extra gasket. They said that the diffs should wear in and after the first diff oil change to possibly add the removed shim back in if it seems like it needs it. The info I have read indicates its suppose to handle better on rough tracks which is what I really wanted it for. Looking to run this same setup. Any suggestions on where to find the batteries would help. I have looked at Hobbyking, but all batteries seem to be to looong! I have ran the 6s 1400kv for 2 years now. I get a solid 12+ minute run time out of nano-tech 2650mah 6s. Love it. I have had a few bec problems but that is it. I run 6s 1350kv in my truggy with 3000 mah and same runtime. The nano 3000 mah is a good battery if you have a heavy finger and only weighs 400grams. +1 6s 2650 Nanotech packs have been really good for me in buggy with 1400 motor and I use the 6s 3300mah packs in truggy with the 1350 motor. Ive also had great success with the Thunderpower 2700 6s packs in buggy. Using the 6s 3300 pack in my buggy gets me 16-18 minutes of run time depending on traction. One think Ive been doing to eliminate the BEC from the equation is to unplug the red wire from the ESC going to the Rx and make a wire harness that just plugs into the balancing tap of the battery and goes directly into the receiver. The wire harness just picks up 2 of the cells in the pack and supplies a direct 2s voltage to the radio system. Works great and one less thing to worry about. it does use 2 f the cells and theoretically would make the pack go out of balance but chargers now days balance the pack n every charge anyway so it really isnt an issue at all. I finally got a chance to start assembling my kit last night. There were no problems encountered with the diffs; I built them using the number of shims recommended in the instructions and they spun freely. +1, everything went together smoothly. Just do as the instructions say step by step and and spins very free. Ya, that's definitly not machined right. I would get ahold of AE. They did send me a new one. It came yesterday but I already had one from my A Main order. Good first experience with AE customer support. do you think that 16mm tapered shock pistons ,10x1.1 fit on rc8.2e ? where i can find a drilled bit 1.2/1.3 ? Finished the build. On the 2 rough diffs I ran them in a bit on the bench by holding one wheel and letting the other wheel spin. Took about 10 minutes of this going back and fourth between wheels and in forward and reverse but they smoothed out nicely. 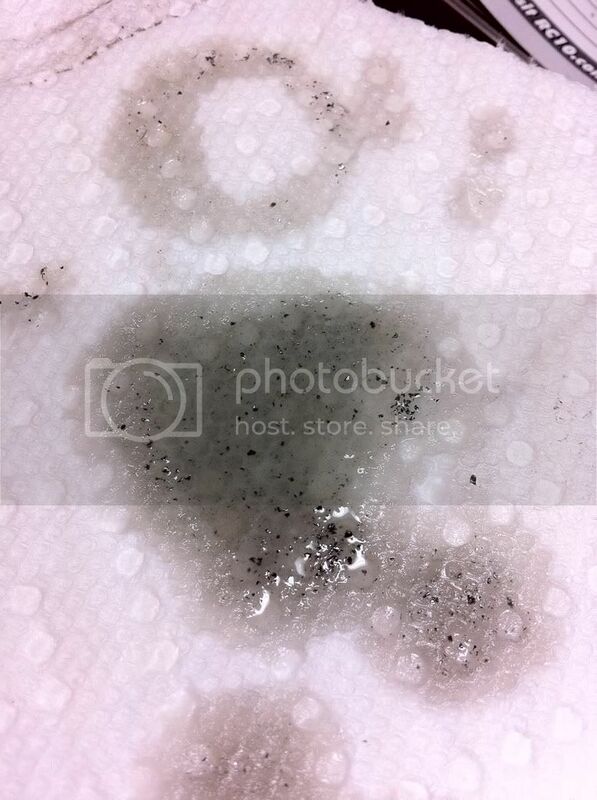 This is a pic of the metal shavings that came out of the diff after that break in. If you had a rough diff that you needed to break in I'd reccomend changing the oils as soon as it smooths out. This doesn't seem like something you want running through the gears for too long. Other than this the build was smooth. Can't wait to get it on the track. Just gotta get the paint on it now and it's all set. holy crap!!!!!!!!!!!!!!!!!!!!!!!!!! i wonder if the nitro is the same way??????????? Thats good news to hear. All times are GMT -7. It is currently 09:12 PM.